James Wyatt joined Magic’s creative team in 2014 after more than 14 years working on Dungeons & Dragons. He has written five novels and dozens of D&D sourcebooks. Over a thousand years ago, one woman stood between her world and the brink of destruction. 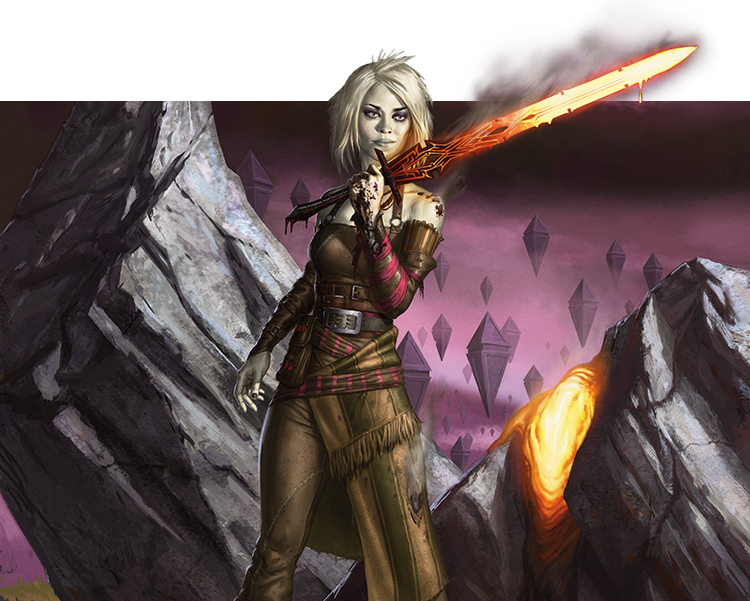 The kor Planeswalker Nahiri, called the Lithomancer, helped imprison the Eldrazi on her home plane of Zendikar over 6,000 years ago. Planeswalkers in those days were ageless and virtually immortal, and Nahiri had no intention of leaving Zendikar unguarded. She settled in to keep watch over the Eldrazi titans' prison and waited. Until things changed. The Eldrazi stirred. Nahiri woke. This was not the great reawakening of the Eldrazi seen in the storyline of Rise of the Eldrazi—the titans themselves remained imprisoned, even as their lineages ravaged Zendikar. This was around a thousand years earlier, and it might have led to a great rising…were it not for Nahiri standing in the way. Nahiri was one with the world. Eyes closed, she sat in a cocoon of stone, every inch of her skin connected to the bedrock, the solid foundation of Zendikar. Everything that touched the earth touched her, an endless march of meaningless motion as she and the world simply existed, being without doing. How long had she been there? How many generations of people and animals had come and gone since she retreated into this chamber and pulled the stone up around her like a cairn? It didn't matter. She was immortal, ageless as the world itself. Am I even still alive? She had not left Zendikar since the day she had brought Sorin and the Spirit Dragon here, when they began their fateful work of imprisoning the Eldrazi. At first, she had stayed to keep watch. Their plan seemed to have worked: the prison held, and the Eldrazi were all but forgotten. But Zendikar didn't like holding them. Akoum still quivered and shuddered around their prison, as though it were trying to vomit them up. If she left, she had thought, how could she know that her world remained safe? 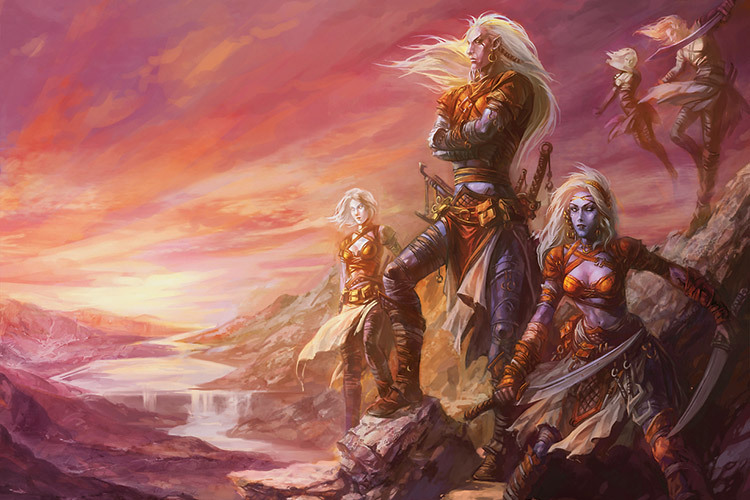 And for those first few centuries, she had lived—really lived—among her own people, the kor. She had cooed at babies and wept at funerals, laughed around tables piled with good food, and fell in love…twice. She had taught lithomancy to a long, long stream of students, showing them how to use stone and the metal within it to form objects and weapons. She had trained the kor to keep watch over the Eldrazi prison, leading bands of them on long pilgrimages across the plane. She showed them the focal points of the hedron network's power, and taught the stoneforgers among them how to test the walls of the prison, to make sure the—she had called them "gods," to help the kor understand—to make sure the gods did not emerge to ruin the world. But her students learned and moved on. Her lovers aged and died. Birth followed birth, over and over, and one funeral followed another, and eventually she couldn't remember why it mattered…any of it. So she had made her way back here, to the chamber of the Spirit Dragon, the place she and Sorin had called the Eye of Ugin in a sort of shared joke. Her footsteps echoing in the vast stone hall, she had briefly considered trying to summon Sorin, the one person she knew who had existed longer than she had, who might understand the bleakness she was experiencing. He hadn't come to visit her in decades, but they had agreed that the power of the Eye of Ugin was to be used only in case the Eldrazi prison was broken. She had sat down, all those years ago, and closed her eyes. And felt the world move on, all its people desperately carrying on as if their brief lives meant anything. Now, she stayed on Zendikar because she couldn't think of a reason to go anywhere else. How long had it been? It didn't matter. Why could it possibly matter? When the world broke, it wrenched at Nahiri's gut like a blade. Akoum thrashed like a hooked fish pulled from the water. Through waves of crippling nausea, Nahiri tried to find the source of the world's pain, whatever bite or sting had provoked this response. As Zendikar shook around her, her mind found its way to the brink of an abyss, an utter void—the prison of the Eldrazi. It was open. It was all metaphor, of course. The Eldrazi weren't contained, they weren't physical beings that could be held. They were creatures of the Blind Eternities, and their manifestations on Zendikar were mere projections, like puppets' shadows cast on a wall. The great spell that she, Sorin, and the Spirit Dragon had wrought was not a simple cage. It bound the Eldrazi to Zendikar by holding their shadows, so they could neither move through the plane nor withdraw from it. But something had shifted, just slightly. She sensed restless movement from the titans, as though they were testing the strength of their bonds, and the seething motion of their broods bubbling into existence around them. The Spirit Dragon had explained, once, that these teeming throngs of lesser Eldrazi were like extensions of the three titans, sensory and digestive organs that all connected to the same extra-planar beings. When the titans had first been bound, their brood lineages continued swarming over the world but, with the titans in stasis, the lesser Eldrazi were like bodies spasming in the throes of death, their heads severed. Eventually, the people of Zendikar had finished them off. And as long as the prison had held, no new Eldrazi were created. Now they were erupting from the ground, their every movement a prick of pain in Nahiri's flesh—a sensation she had not experienced in ages. She observed the feeling curiously, noticing the annoyance it stirred in her mind. She considered discarding those feelings and letting the Eldrazi free themselves, letting them annihilate Zendikar and its people and her along with them, letting them bring an end to the unchanging eternity of her existence and the meaningless passage of time. But she was feeling pain, and annoyance, and with them came desire—a desire for those feelings to end. So she scattered the rock that she had piled around herself and stood slowly, stretching limbs long unused. 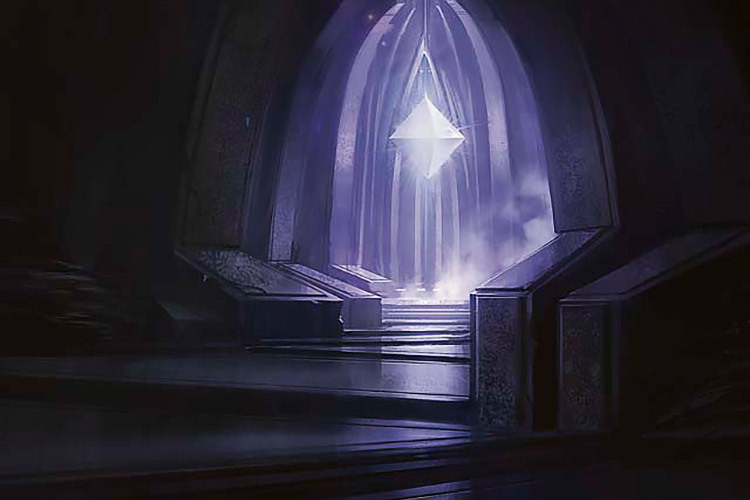 With the stone floor bucking beneath her, she took careful steps—anchoring each foot to the stone with her lithomancy as she moved—to the center of the chamber, where the great glowing hedron stood, the nexus point of the whole hedron network that formed the Eldrazi's prison. Now, at last, it was time to summon Sorin. The Spirit Dragon had worked some magic in the Eye of Ugin that surpassed her understanding, forging a special connection between each of them and that place—a connection that spanned the Blind Eternities. Any of the three of them, standing in that place, could send a message to the others, amplified by the Eye's magic, seeking the others out no matter what planes they were on. This spell was intended for exactly this circumstance, so that Nahiri could summon the others if the Eldrazi ever slipped their bonds. Closing her eyes and shutting out the rumbling of stone around her, she sent her call into the Æther—a wordless summons, which the others would experience as an insistent pull, tugging them toward Zendikar. Her message sent, she settled back onto the floor and pulled the stone back up around her, wincing as the stone carried the sting of the Eldrazi's movements across her skin. Blocking the pain as she waited for the others, she tracked the swarming hosts' advance as they spread out from Akoum. She blinked once, and felt the pounding of running feet as the Zendikari fled, then the steady march of armies organized to face the Eldrazi. She blinked again, and felt Zendikar writhe in pain as the greater Eldrazi of the brood lineages annihilated life and mana in their path, absorbing the energies of the lush natural world. She blinked a third time. The sudden thought jarred her back to full awareness. For a moment, she thought the notion of the Eldrazi breaking free had been a sort of dream, but the pain that crawled across her skin confirmed that the Eldrazi broods were still swarming across the plane—and they had spread far while she waited for Sorin and the Spirit Dragon. They hadn't come. Sorin hadn't come. She was alone. She wanted—wanted the pain to end, wanted to see Sorin again—and with some surprise, she realized she wanted to preserve Zendikar, the plane; and all its lost, meaningless, desperate people. But while she had been waiting, the situation had become so much worse. She pulled her stone cocoon up over her head and disappeared into the rock, then emerged at the summit of a nearby mountain. Eldrazi teemed in the valleys below her, turning the ground to chalky dust in their wake. Shuddering, she stomped her foot on the rocky mountain face and sent an avalanche to crush the abominations. Then she vanished into the rock again and emerged in Ondu, near a kor city she had visited many times in the early years of her guardianship. The Eldrazi were there as well, but the city lay in rubble—dusty ruins, long abandoned, surely long before the Eldrazi emerged. With a wave of her hand, she closed the canyon to swallow the Eldrazi as she entered the city through a gap in its crumbling wall. "I know this street," she murmured. Her voice was a crunch of gravel, so long unused. She remembered haggling in the marketplace, ahead on the left, to buy a—what was it? Something bright and blue that made her smile. Soft. "A scarf," she said, and decided that it was true. All the pleasure and heartache of life rushed over her in a moment. Memories flooded her mind—the sights and sounds and smells of the bustling marketplace, the laughter in her heart, the taste of her lover's kiss, the bitter sting of tears. This had been a place of life once, a place where she had lived, and she had missed its fall. The city had changed, even before its abandonment. Taller buildings had replaced familiar ones here and there, and a whole block had been destroyed and rebuilt since her last visit. A huge stone structure now stood, mostly intact, in a place that had been tenements. Curious, she stepped through its front arch. Just inside, she saw herself carved in stone, stretching her arms wide in welcome. She stopped and stared. It was definitely her. The figure was carved in relief from the wall, one leg protruding as if she were about to step from the stone. It must have been a stoneforge mystic, probably one of her students, who drew her features out from the rock. She traced her fingers along the smooth cheek of her stone incarnation, then her eyes fell on the wall from which the relief emerged. She stepped back to see it better. Engraved behind and around the relief was another figure. But it wasn't the Eldrazi titan—at least not exactly. In its overall outline, the figure could have been Kozilek, but the features were those of a male kor wearing a strange geometric crown that mimicked the bizarre obsidian plates that hovered over the titan's alien form. 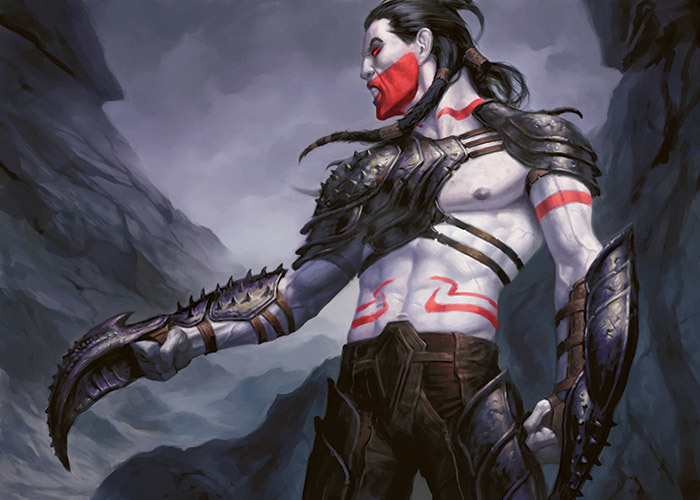 The kor's arms were spread wide, above the stone Nahiri's, and each hand gripped the hilt of a sword whose broad blade extended back along his forearm to the elbow, suggesting the Eldrazi's bifurcated limbs. Above the male figure's head, an arcing banner proclaimed the subject of the artwork: "Nahiri the Prophet, Voice of Talib." She turned her back on the sculpture and strode out of the building. Outside, she raised her hands and clenched her fists, and a cloud of dust billowed around her as the building collapsed in on itself. It was her fault. She had been the first to call Kozilek a god, and apparently the kor had remembered that word more than they had remembered her dire warnings about the gods destroying the world. She felt sick. One by one, she visited the sites along the route she had taught the ancient kor, the focal points of the hedron network. Wherever she emerged from the stone, she found Eldrazi nearby. Each time, she opened the earth to swallow them up or sent cascades of rock down to bury them. Killing the Eldrazi broods was not the problem—any mere mortal could do that. But only she could stop them from coming into being—that was to say: only she, Sorin, and the Spirit Dragon. But she was alone, and she would do it alone. She would have to. She almost didn't bother with the stops in Akoum. So near her resting place in the Eye of Ugin, she would certainly have noticed anything disrupting the hedron network, so there could be no point in examining those locations. But she decided to be thorough, if only because each site was an opportunity to revisit the world she had all but forgotten, to taste the memories that each place brought to the surface of her mind. But then she visited a site high in the mountains near the Eye of Ugin. And in the very spot where she had taught the kor to test the strength of the hedron network, an unfamiliar stone building now stood. In contrast to the smooth stone of the kor structure, this one was formed of jagged, rough-hewn blocks with huge metal spikes jutting from the mortar and curving toward the sky. The ground was rippled, as though the building had sent out enormous roots that pushed the stone upward. Even as she approached, she could tell that this was the point where the hedron network had been disturbed. Right under her nose, while she sat alone in the Eye of Ugin. Fury boiled up in her, directed as much at herself as at whoever had done this. Fury—another feeling she had forgotten. It felt good. She strode toward the building, each step shaking the ground and causing trickles of gravel and dust to run down the walls. As she drew near, three dark figures came around the building from the other side, crouching into combat stances as they spotted her. She paused in her advance, falling to one knee and reaching a hand into the earth beneath her. The advancing figures slowed, wary. Then, with a shout, she pulled a glowing-hot sword from the ground and charged. The figures seemed human, but she didn't recognize their clothing from any culture she knew. Flimsy gauze barely covered their chests, revealing the stark red paint adorning their ashen skin. Sharp hooks protruded from their shoulders and upper arms and, as they snarled at her approach, she saw slightly protruding fangs. Vampires? she thought. There are no vampires on Zendikar. Then she met them and her glowing sword cut through cold flesh, sending spurts of ruby blood steaming into the air. She stepped over their bodies and tore her own doorway open in the rough stone wall. More of the vampire-like creatures scuttled away from her in surprise, then lay still on the floor in her wake, until at last she stood in a large central room. 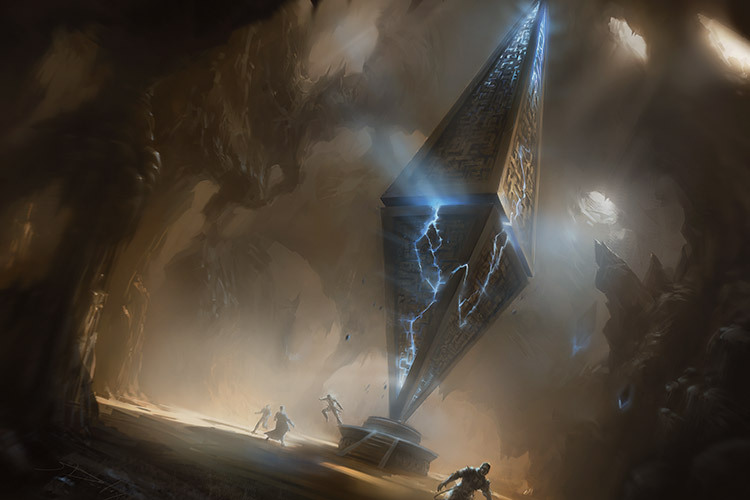 At the center of that room, in exactly the point where the lines of the hedron matrix joined, stood a large stone altar. The worn slab that formed its top was stained with old blood. Nahiri glanced around the chamber, spotting a few more vampires—could they actually be vampires?—scurrying out of the hall. To one side stood a huge stone statue, carved in a likeness that seemed like a half-remembered vision of Ulamog. It had sharp, human features beneath a helmet that strongly suggested the strange face-plate of the Eldrazi titan. 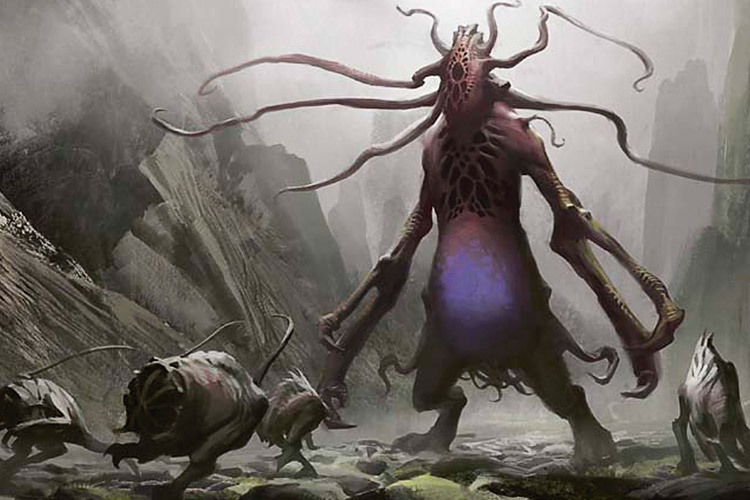 Instead of legs, it had a mass of writhing tentacles, true enough to the Eldrazi's actual form. In its two human-like hands, it clutched the shoulder horns of a kneeling vampiric figure carved beneath it. "More damned gods!" she cried. "Whatever you idiots thought a god might be, the Eldrazi titans are not that." Even so, whatever rituals of sacrifice had been performed on this altar had been effective. Whether Ulamog heard the vampires' prayers or not, their rites had successfully disrupted the hedron network enough for the Eldrazi broods to spill forth. Laying both hands on the stone altar, she stretched out her senses to assess the damage. It was a subtle change, the barest alteration in the network of the hedron prison. But it had allowed the Eldrazi titans just the smallest amount of room to move, to extend their presence into Zendikar once again. It could be repaired, of course, but it would take time. And it would be much easier if she had help. "But no help is coming," she said aloud. "I'd better get started." With a sigh, she looked around the building for a stone of appropriate size. Her eyes lit on the grotesque statue and she smiled. "Perfect." She walked over to the statue and reached both hands high above her head, just reaching the hooks on the vampire's shoulders, where the bizarre Ulamog's hands were. Then she pulled downward and the whole statue changed. It had taken forty years to establish the hedron network—what had seemed like a lifetime to her then, when she was still immersed in her connections to ordinary mortals. Crafting one single hedron would not take nearly so long, though she did it alone. The hardest part would be shaping the surface without Ugin's guidance. What had been a statue became a formless mass of stone under Nahiri's hands, then eight triangular sides with sharp edges. Closing her eyes as she drew a deep breath, she tried to focus on the patterns she would need to scribe in the surface to properly redirect the flow of mana. The pounding of footsteps on the surrounding ground broke her concentration and she sighed. More vampires surrounded her, advancing slowly with long, curved swords drawn. "Do we have to do this?" she said. "It's getting tedious." One of them hissed. "You defile our—"
"Fine," she said, and brought the walls down on them, then returned to her work. Painstakingly, she ran her fingers over every inch of the hedron's surface, shaping the precise patterns the Spirit Dragon had taught her. When a swarm of Eldrazi came scurrying over the rubble toward her, she pulled up the stone to form a solid dome around and above her, sealing her in and the Eldrazi out. 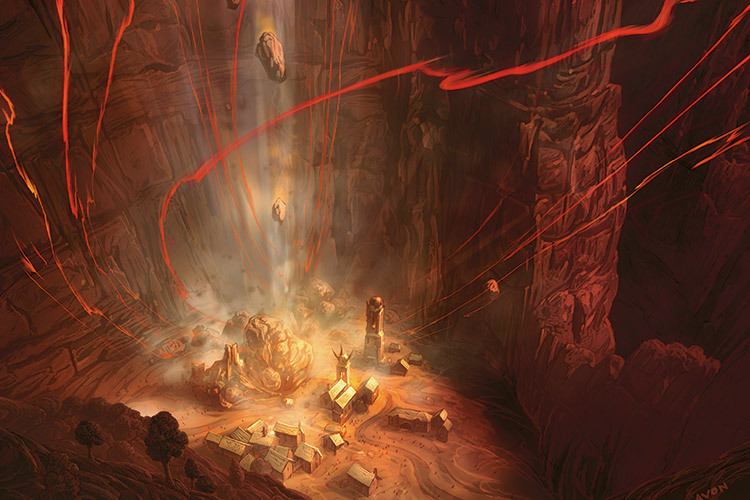 When the Eldrazi's Aura of corruption weakened the stone and made the dome start to crumble, she tumbled it down onto them and raised a new one. It seemed to take forever, which struck her as odd. She had no clear idea of how long she had sat in the Eye of Ugin, meditating as the sensations of the world washed over her. She had left her life behind and cocooned herself away in the rock. But now, with the Eldrazi teeming across her world again, she felt hurried. Partly, of course, she wanted to seal the Eldrazi prison before too many people lost their lives battling them. But partly, she realized, she wanted to finish this task so that she could get back to the business of living. Perhaps she had been cocooned long enough and she was ready to emerge into a new life, like a fully grown geopede. Perhaps the taste of bitter memory—of wistful longing, and especially of passionate rage—had awakened her from her centuries-long slumber and sparked her into a new wakefulness. In any event, she wanted to finish this so she could set out on her life's next step, whatever it might be. At last the hedron was finished. Spreading her arms, she shattered the stone dome around her and took a deep breath of fresh air. How long was I in there? she wondered. She shrugged off the passing thought and raised her arms, lifting the hedron stone high overhead in one smooth motion. A mere thought was all it took to turn it just so, to link up the broken lines of the hedron network and repair the Eldrazi prison. She dropped to one knee and put her palms to the ground. She could feel the titans' movement slowing as the restored prison drove them back into torpor. Their broods still swarmed across the land, but that was a problem for the merely mortal. More troubling, Zendikar itself was still reacting—not just in Akoum, as it had since the Eldrazi were first bound, but all over. Quakes shook the ground and reshaped the landscape, surging waves changed coastlines, mighty winds scoured the canyons. Zendikar was twitching at the sting of the Eldrazi, and she suspected it might be some time before it fell quiet again. She let herself sink into the earth and emerged once more in the Eye of Ugin. Placing her hands on the keystone hedron, she assured herself that the network was restored. She thought about calling out to Sorin and the Spirit Dragon again, but she had taken care of the situation. Zendikar was safe again, thanks to her own efforts. She didn't need the others. That didn't alter the fact that they hadn't come, though. They had promised to return to Zendikar when called, to help her maintain the prison that she had guarded for countless centuries. But Sorin had abandoned her, and the Eldrazi had swept across Zendikar once more. Other feelings she had all but forgotten, concern and anxiousness, swelled up in her heart and they made her smile even as they made her ache. They made her feel alive—the sensation of her heart pounding in her chest, the sound of it in her ears, the movement of her muscles as her brow furrowed and her jaw tightened. What had Sorin been doing all the years she had been cocooned here in the Eye of Ugin? Was he still alive? Had he forgotten her and her vigil over Zendikar? Had he succumbed to the same apathy that had held her for so long? She would go and find him, wake him up if she needed to, remind him of her and Zendikar and the friendship they had once shared, remind him what it was to live, to feel, to care. She had saved Zendikar, and now she would save him. And then she would return and walk among her people again, she would teach and laugh and love again, and it would matter again. It would all matter. Nahiri laid a gentle hand on the wall of the chamber and it melted away as she opened a pathway through the Blind Eternities. The walls of the chamber became bleak cliffs in a desolate mountain range. She took a deep breath of unfamiliar air and stepped into this other plane, eager to find her oldest friend.